Via Dolorosa (Lat. "sorrowful way") or Via Crucis (Lat. "the way of the Cross") is the path believed to be taken by Jesus from the place of his condemnation by Pilate to Mount Golgotha, the site of his crucifixion, and then to his grave site. Early Christians continued the ancient Jewish practice of pilgrimages to Jerusalem. Out of this practice came the tradition of the Stations of the Cross as a series of commemorative devotions or meditations. 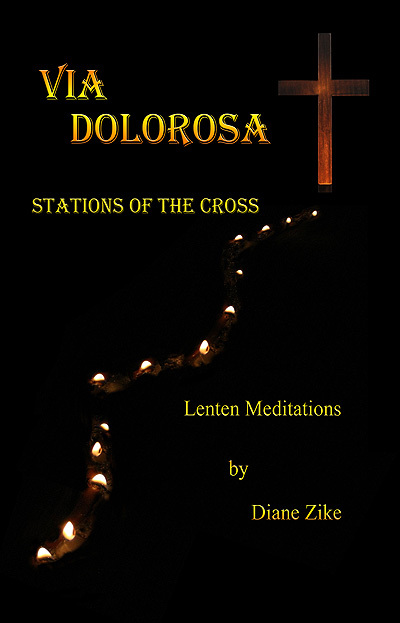 Author Diane Zike continues this tradition with this new book of daily Lenten meditations. Sharon Day of St. Peter's Episcopal Church, Tulsa Oklahoma writes: "What a spiritual journey you will take as you read these Lenten mediations which include The Stations of the Cross. You will understand and more deeply appreciate the sacrifice that our savior Jesus Christ made for all mankind by dying on the cross."